The private equity firm US Renewables Group is converting a coal power plant in New York State to wood biomass, and sees potential for further conversions of similar plants in the U.S. The air around Niagara Falls will soon be a lot more environmentally-friendly once the conversion from coal to burning primarily wood biomass at a power plant two miles upstream on the New York State side of the Niagara River comes on line this spring. By making the conversion from coal to wood, US Renewables Group (USRG) expects to reduce sulfur dioxide emissions by 400 to 500 tons annually. Furthermore, carbon dioxide emissions will be reduced by 160,000 tons per year. The company, which manages private equity funds and is based in Santa Monica, California, owns and operates the power facility. What made this project particularly attractive was the capital savings in converting an existing plant, as compared to building a wood biomass power generation plant from the ground up. USRG has assembled and manages a portfolio of renewable power and clean-fuel assets throughout the United States. One of its most recent acquisitions was the purchase for $31 million of the Niagara Generating Facility from WPS Resources. It is now spending about $25 million to convert the plant from burning coal and tire-derived fuel (TDF) to wood biomass and TDF. Once operational, the plant is expected to produce about 45 megawatts of power. It has signed a five-year power supply contract with a power marketing company in New York State, which provides USRG with stable revenue from the power generated from the plant over the short to medium term. In addition to producing power, the plant will also qualify to sell renewable energy certificates (RECs) to the New York State Energy, Research and Development Authority based on the portion of power generated from its use of wood. New York is one of 27 American states to have adopted a Renewable Portfolio Standard (RPS), calling for a 25 percent increase in the amount of renewable energy consumed in the state by 2013. Nearly 20 percent of the state's power already comes from renewable sources such as hydropower. The state itself has a tremendous heritage of hydro power. For years, Niagara Falls, New York-where USRG's plant is located-had one of the largest hydro electric power stations in the world. 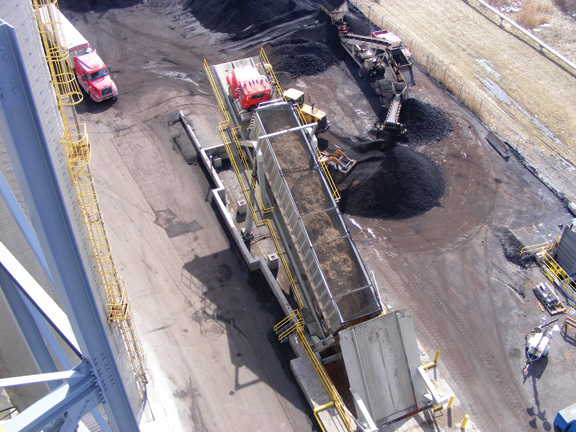 USRG became involved in the Niagara Falls project after being approached by two developers who had initiated discussions with WPS Resources about converting the plant to burn wood biomass instead of coal. WPS Resources had no desire to implement the conversion project, so the developers began searching for a company with deep pockets and the expertise to execute their business plan. They approached USRG, and the private equity firm thought it was a good investment. What made it attractive was the fact that the plant already had an air permit allowing wood and TDF to be burned and a lot of established infrastructure, such as existing TDF suppliers and a circulating fluidized bed boiler, which simplified the switch to wood biomass from coal. The cost benefits in retrofitting an existing power plant versus a greenfield wood biomass power plant project also came into play. 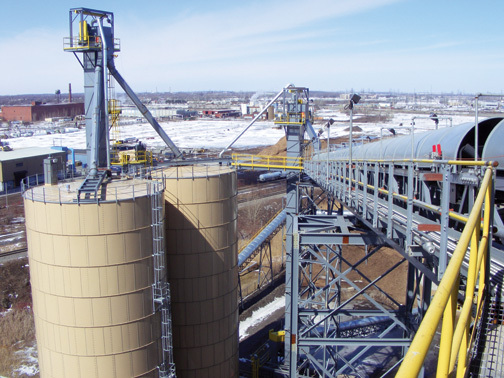 USRG launched a plan to purchase the plant, secure wood biomass supply agreements and a power supply contract, and retrofit the existing plant with a new wood fuel handling system to allow for the use of wood biomass instead of coal. While the cost for a brand new greenfield project is probably well in excess of $3 million per megawatt, by acquiring a plant and converting it, USRG was able to achieve a cost in the region of $1.5 million per megawatt, says USRG principal, Scott Gardner. As one of the first companies to have successfully completed a conversion of this nature in the United States, Gardner adds that USRG has established itself as a leader in this type of business venture. Given its experience, it is now considering other similar new business ventures. "That's already proven itself, as a couple of other new business opportunities have emerged in other parts of the country that we are pursuing now," says Gardner. "I think we've learned some amazing lessons. We've learned how to establish a fuel program, to manage the construction process, identified what some of the key timeframes are and what are some of the vendor issues." Pennsylvania is one geographical area where USRG sees potential for further conversion of smaller coal power generation projects. However, it is also investigating potential targets in both the Midwest and Western United States. The limiting factor for potential coal-to-wood biomass conversion projects will always be access to economical biomass fuel. Wood delivery and processing costs will limit the upper end size of power plants that can be considered as potential conversion targets. The amount of biomass fuel needed as feedstock for larger power generating plants and the distance to transport the biomass simply make some projects uneconomical. About 70 percent by weight of the Niagara power plant's total fuel will be wood, which is drawn from about an 80-mile radius around the plant. Gardner says establishing relationships with suppliers has been a learning experience for the company and maintaining an adequate supply over the long term will always be a concern. The project company, Niagara Generation LLC (NiGen), which is a subsidiary of USRG, has established wood supply agreements with a number of utility companies, vegetation control enterprises, and some of the 20 towns and municipalities within the 80-mile radius around the plant that were spending money to dispose of their wood waste. NiGen provides collection yards for these towns and companies so they can inexpensively dispose of their wood, and then spends between $5 and $15 per ton to transport the wood to the plant and process it. Working in its favor is the amount of wood waste that was generated by an ice storm that hit the Buffalo, New York area in 2006, which knocked down 30 percent of the trees in the vicinity. As part of the clean-up effort, a lot of the wood was chipped, creating piles of surplus wood waste waiting for an end use. However, on the downside of the wood supply issue, New York State requires the power plant to burn only clean, unadulterated wood waste. It can't use construction and demolition debris unless it has been separated at the source. Most other states allow the sorting to take place at a transfer station or a material recovery facility, but not New York State. This significantly limits the amount of wood biomass that is available. "There are some pretty sophisticated technologies for separating out treated or contaminated wood, and I think it's a little bit antiquated that the state would limit itself on its renewable energy potential because of that," says Gardner. "We're going to continue to lobby in New York for a change to that rule so that greater amounts of clean, unadulterated wood are made available because they can be separated out at a transfer station, rather than at the source." What made the Niagara Falls project particularly attractive to the US Renewables Group was the capital savings in converting an existing plant, as compared to building a wood biomass power generation plant from the ground up. About 70 percent of the Niagara power plant's total fuel will be wood. Wood supply agreements have been established with vegetation control enterprises, and some of the 20 towns and municipalities near the plant that had been spending money to dispose of their wood waste. 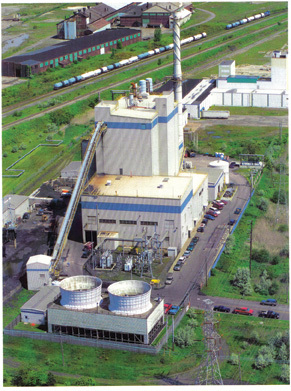 One of the key pieces of infrastructure that already existed at the Niagara Generating Facility was the circulating fluidized bed boiler, which was originally installed because it provided better emissions performance. Because of the boiler's capability to accept a variety of fuels, USRG was able to use it largely as is, "although we have added some elements to improve the controls of the boiler so that we can better monitor the boiler performance with the changing fuel," says Gardner. He adds that the company has also upgraded and installed a new distributed control system, "which makes a big difference to monitor combustion performance, air flow and emissions performance." The fuel is a mix of TDF, green wood fiber and dry wood fiber. It is important to maintain control, particularly of the amount of green wood fiber entering the fuel flow stream. Its higher moisture content tends to put a damper on energy output. USRG was founded in 2003 and manages two private equity funds. The first fund, which closed in 2005, attracted $100 million in capital that has been invested. The second fund, which closed in 2007, attracted $475 million. "There's been no let-up in interest in this sector and it's continuing to grow," says Gardner, "particularly with some of the things going on in the market right now, such as oil prices and the regulatory situation, where more states keep adding Renewable Portfolio Standards (RPS). So the demand represented by these regulatory mandates is enormous." USRG estimates that about $50 billion in new capital will be needed just to meet the demand created by the Renewable Portfolio Standards that have been legislated by the 27 participating states. At present, USRG is generating about 120 megawatts of power from three projects, but it has about another 250 megawatts of potential new investments under review. Investing in renewable power generation is only half of the company's investment portfolio. It is also involved in the manufacture of biodiesel, ethanol, and cellulosic ethanol, and owns a company that erects the infrastructure required in the storage and transportation of biofuels. When describing the principal owners of the company, Gardner says, "We're energy people who have recognized an opportunity, although there's no doubt that we feel passionate about what we are doing for reasons beyond making money."